Bolivia have been sanctioned by FIFA for using an ineligible player in two World Cup qualifiers and have been forced to forfeit both of the matches. As a result, South American World Cup qualifying has been shaken up and Argentina are now out of a qualification spot. 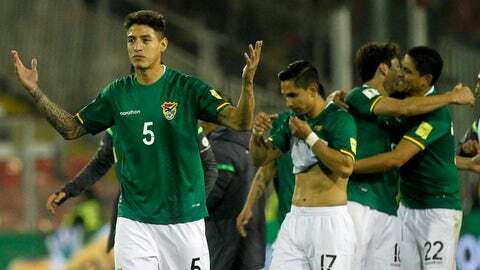 Bolivia used Nelson Cabrera as a substitute in their 0-0 draw with Chile and 2-0 win over Peru. However, Cabrera was born in Paraguay and not eligible to play for Bolivia. As a result, Bolivia had to forfeit both matches and Chile and Peru have been handed 3-0 wins. With the newly-granted 3-0 win, Chile have jumped up level with Argentina for fifth place. Both teams have a +2 goal difference, but Chile have scored more goals (with the help of the forfeit) and hold the tiebreaker over Argentina. The top four teams in qualifying automatically qualify for the 2018 World Cup, while fifth place goes to an intercontinental playoff. 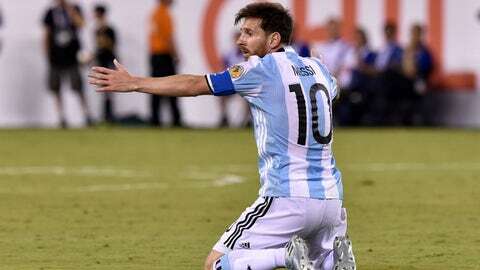 If World Cup qualifying ended today, Chile would go to that playoff and Argentina would not make the World Cup. South American World Cup qualifying is only through 10 of 18 matches so there is plenty of time for Argentina to climb the table and book their spot in Russia. But their rocky start to qualifying now looks even worse thanks to Bolivia's forfeits. All the while, Chile may have been given a lifeline. We will have to wait until qualification is over to see if Bolivia's use of an ineligible player changes who goes to the World Cup and doesn't, but it sure looks like it's going to have a big impact. The forfeits don't do much to Bolivia, who were already floundering and unlikely to make the World Cup. The same goes for Peru, who are still five points back even after being given three points. But those two extra points (and the three goals) going Chile's way will loom large. And all for a player who just made two substitute appearances.